Usually, when I am feeling a little down, I try to console myself with the same simple, comfort food that my mother and my grandmother cooked for me when I was growing up in Colombia. 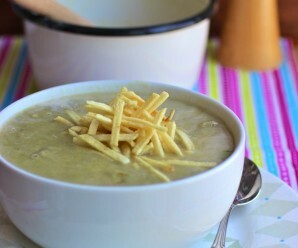 Caldo de Papas is a traditional Colombian soup, of which there are at least a few variations. 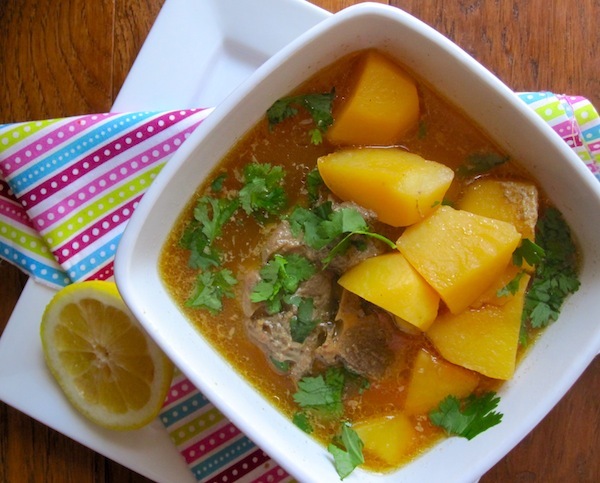 The base of the soup is potatoes and a protein such a beef ribs, pork ribs, or beaten eggs. In some parts of the country, this soup is served for breakfast with bread on the side. 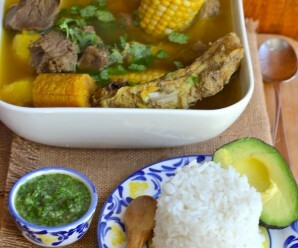 My favorite Caldo de Papas recipe is my grandmother’s. She used pork bones (espinazo de cerdo)or pork ribs. 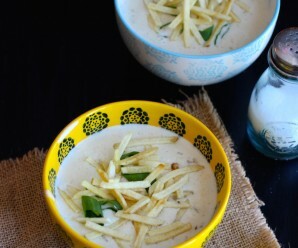 There is nothing fancy about this potato Soup, just potatoes, pork bones, spices and a lot of family memories. Place the onion, garlic, red bell pepper, scallions, cumin and achiote in a blender and blend until smooth. 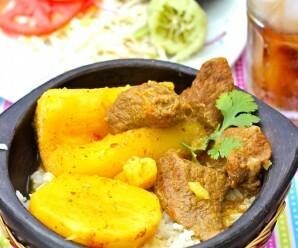 In a medium pot over medium heat, place the pork bones, water and onion mixture and cook for about 30 minutes. Taking out the foam from the pot every 15 minutes. Add the potatoes and season with salt and pepper, increase the heat to medium-high, and bring to a boil. Reduce the heat to low, cover, and gently simmer until the potatoes are soft, approximately 40 minutes. Taste and adjust seasoning if desired. Sprinkle with fresh cilantro and serve immediately with avocado and ají on the side. el espinazo es carne de res o de cerdo? yo creo que es carne de res. That soup looks simply lovely!! Stews and soups are definitely my favorite kinds of comfort foods! This looks stick-to-your-soul good! This looks perfect for a cold winter night. I think I’ll be making this very soon. There is nothing like comfort food mami or abuela used to make. My father is from Cisneros and I’ve spent the last five years trying your recipes out on my family and friends. This recipe came out perfectly! Your Sudado de Pollo was also exactly how I remember mi Tia making it in Medellin! I also use your empanadas recipe. I am excited to try this one tonight! Would a frozen bag of assorted seafood work for this too? Do you cut the potatoes in half?